Before I start with this story, I want to establish a point and that is if you do find yourself on the way to Africa ever, you must promise yourself to learn how to be patient and really quiet because these are the two traits that almost completely dominate the scene here guaranteeing the most sightings and most importantly the most wonderfully captured shots. Well now that the point is clearly established we can move to the actual story. So, the story begins on the beautiful south African road from Durban to phalaborwa. Now the interesting thing here is that we decided to enter Kruger through phalaborwa for a number of reasons. Generally Kruger national park is immense and is spread over two countries, South Africa and Mozambique. Phalaborwa is a town situated in the Mopani district, Limpopo province South Africa, it is the only town in South Africa that borders Kruger National Park, the border of Mozambique being only 2 hours drive away, it’s a perfect place to start the Kruger experience. We reached phalaborwa in the evening, driving all the way from Johannesburg, it’s a small little town swarmed with tourists who want to get to the Kruger national park. I really liked the vibe of this place. The best part was the dinner, that we had in a small local pub, totally mouthwatering and so welcoming. I would say when travelling, look for the places the locals frequent, there’s the treasure. 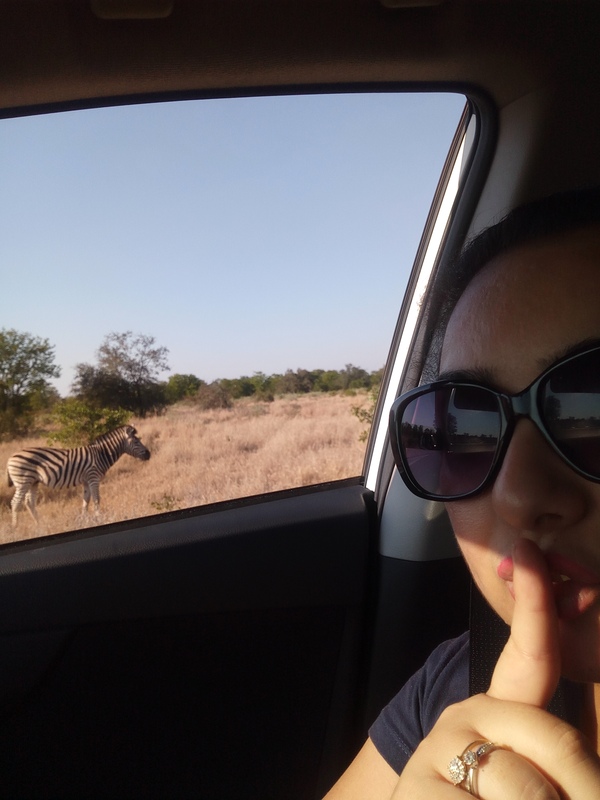 The next morning started with our much awaited adventure, we entered Kruger through the phalaborwa gate, and in the first 500 meters we had the startling realization that we were in the thick of the African wild. A family of giraffes were right in front of our eyes, I regard that moment as the most spellbinding in all of my travels. They were close enough to touch! …and then from there started our journey into the most fascinating part of nature, the untamed, uncut wild. There were just so many spellbinding adrenaline pumping moments that I can’t even summarize in one blog. From phalaborwa gate we covered Mopani, Letaba, olifants, Satara and orpen over the next few days, Letaba and olifants being my favourites. On the last day we were literally chased by a Matriarch of an elephant herd, that was crossing the road and even though we stopped at a respectable distance for them to cross, I think she perceived us as a threat and charged a little distance then stopped. After her entire herd had crossed over she looked back at us one last time and peacefully went away. I can never forget the look on the elephants face and my respect for these magnificent animals has only grown. So from there we moved on to hazyview where we spent another lovely day, the top of the list was the hippo point in hippo hollow where you can see hippos in the wild and right up close, we spent hours looking at the playful hippos. So now that I have inspired you enough to plan this journey here is some information that might come handy..
Johannesberg 405 kms driving time around 5 hours with leisure . Leaving you with some pictures we clicked on the way. ..So I urge you travel bugs to visit Kruger once, it will change your life forever, and for the better. Oh the one with giraffes is my favorite, they were just so beautiful and close enough to touch! This just sounds a like a dream mini vacation waiting for me. What an adventure that must have been to see the animals so close up. It was awesome, part of a month long South Africa trip. What an amazing adventure! I would so love to visit someday!! That is one awesome adventure and it’s definitely a memorable one too. I’ve never been to any part of Africa before, it would be nice to do so. What a wonderful experience! I’ve never been to anywhere in Africa but friends have recommended that we go there! This post makes me want to schedule a flight and go there right now! SO exciting! What an amazing story. I can’t believe you were chased by elephants, I think that would have been a scary but cool experience! Africa looks so beautiful indeed. That is a really nice place and really great for the family. I like that the animals are not cages. It’s a national park so actually protected wild area. It’s really great. Wow what a fun adventure in Africa. We have been dying to plan a safari of our own. I’m a huge animal lover, so being able to see them in their natural habitat is such a wonderful experience. You were able to see them so close! I agree Melanie, there is nothing more beautiful than seeing nature in its wild raw and untamed form. I am glad you liked it. I always wanted to go on a safari in Arica. You guys look really enjoy! I hope I could experience it too. Africa is beautiful. You will definitely like it.